CuW composites were synthesized using an equal channel angular pressing (ECAP) technique. Microstructural evolution during sintering process was investigated using both optical microscopy and transmission electron microscopy (TEM), and their deformation mechanisms were studied using finite element analysis (FEA). 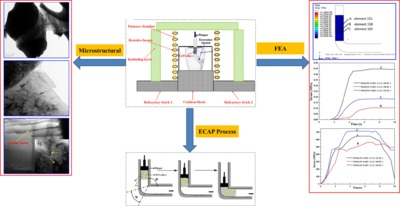 Results showed severe plastic deformation of the CuW composites and effective refinement of W grains after the ECAP process. TEM observation revealed that the ECAP process resulted in lamellar bands with high densities dislocations inside the composites. Effects of extrusion temperature and extrusion angles on stress-strain relationship and sizes of deformation zones after the ECAP process were investigated both theoretically and experimentally. When the extrusion angle was 90°, a maximum equivalent stress of ~1001 MPa was obtained when the extrusion test was done at room temperature of 22 °C, and this value was lower than compression strength of the CuW composites (1105.43 MPa). The maximum equivalent strains were varied between 0.5 and 0.7. However, when the extrusion temperature was increased to 550 °C and further to 900 °C, the maximum equivalent stresses were decreased sharply, with readings of 311 MPa and 68 MPa, respectively. When the extrusion angle was increased to 135°, the maximum equivalent stresses were found to be 716.9 MPa, 208 MPa, and 32 MPa for the samples extruded at temperatures of 22 °C, 550 °C and 900 °C, respectively. Simultaneously, the maximum equivalent strains were decreased to 0.2–0.4. Furthermore, results showed that the maximum equivalent stress was located on the sample's external surface and the stress values were gradually decreased from the surface to the center of samples, and the magnitudes of plastic deformation zones at the surface were much larger than those at the central part of the sintered samples. FEA simulation results were in good agreements with experimentally measured ones.